I knew it was coming. When my boss told me on a Friday that he wanted to meet on Monday, I figured it couldn’t be good. 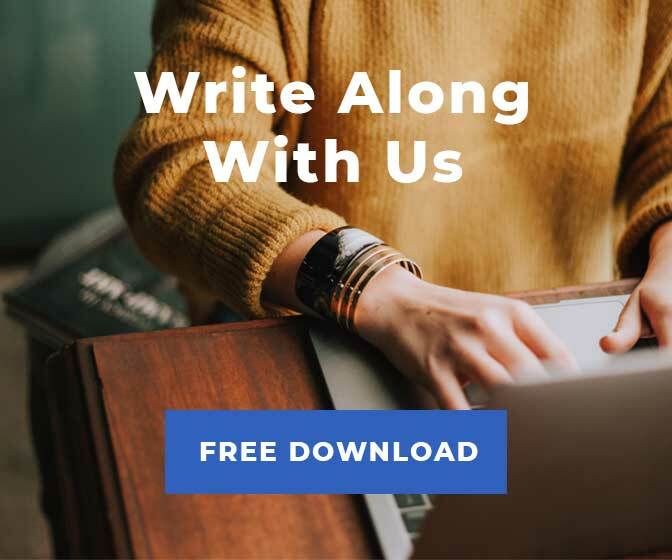 We weren’t getting along, my boss and I, and while I’d seen him fight — red-faced and shouting — with other writers at the magazine, the silent tension in his jawline when I spoke to him seemed more ominous than a raised voice. We’d been engaged for a couple months in what I initially saw as run-of-the-mill writer-editor conflict over a story I was writing about the overuse of antipsychotics in children. I didn’t get the sources I needed, and I knew it was going sideways early on. But when I went to him for guidance — frantically waving an illegible flowchart of themes and ideas at him — he was unable to help. When the deadline came, I turned in a version that wasn’t even halfway there, and I saw the disgust on his face after he read it. Not disappointment or frustration or irritation, but disgust. It wasn’t the kind of look you can come back from. But I wanted to try. I’d been at the magazine for three years, and I was attached. I loved the people I worked with. I felt I had a contribution to make. I could see myself playing a role in making it better, and helping it evolve in an uncertain media landscape. When I slept in the office for two nights to cover the pope’s visit — next to my confused three-legged Chihuahua on a co-worker’s couch — it felt like home. So I decided to be honest with my boss, and explain that I was simultaneously dealing with a romantic dustup, lingering symptoms from a bout with Lyme disease, and “some psych issues,” as I put it in an instant message to him — all of which, I explained, contributed to my struggle with the article. If my boss hadn’t been thinking of getting rid of me before this — if he’d been considering laying off other staffers, say, in the upcoming round of cuts — I had just provided the ink for my pink slip. Leave of absence, you say? Let me help with that. It was some comfort that I was laid off with two other people, and that I wasn’t fired — at least officially — for cause. But I’ve been in my boss’ position before. I’ve fired people, and I’ve laid people off. And I know: There are always choices. He chose to get rid of me. That hurt. Losing a job is disorienting for anyone, no question. 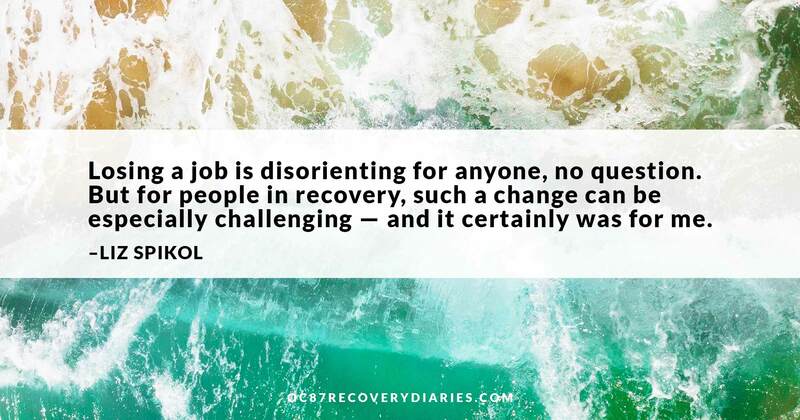 But for people in recovery, such a change can be especially challenging — and it certainly was for me. People assume I’m exaggerating or using a figure of speech when I say, “I was in bed for two months after I got laid off.” I love rhetorical flourish as much as the next writer, but in this case, I am being quite literal. The aforementioned Chihuahua — who likes nothing better than cuddling in bed — would confirm my account if she could, as that period after I got laid off was probably the best two months of her life. The severity of my depression in the wake of losing my job really solidified a notion I’ve always paid lip service to but didn’t entirely believe: that, for people with mental illness, having a job (whether paying or volunteer) can make all the difference. I didn’t always believe this. 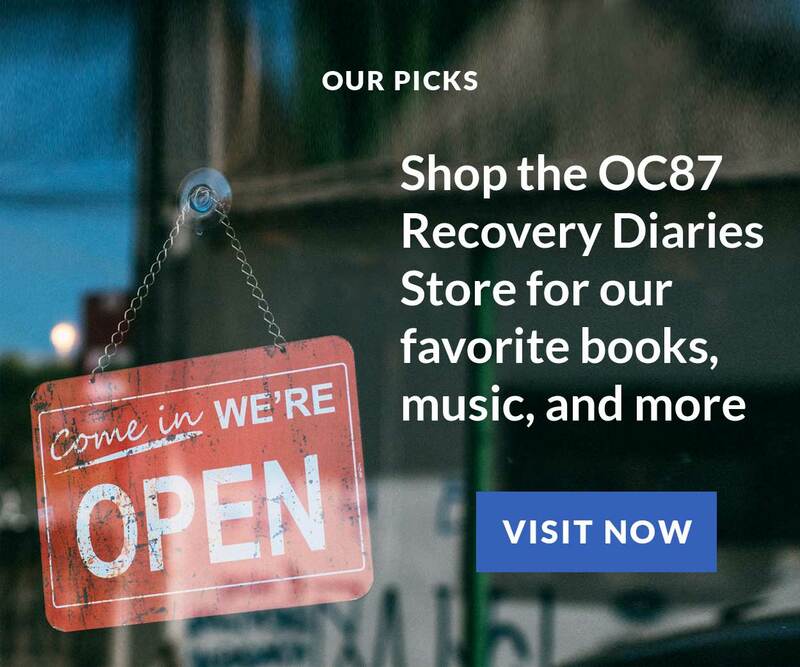 In the early years of my public speaking — when I was asked to account for the success of my recovery — I had a tendency to overemphasize the role that medications played. I remember someone reminding me before one gig to include family and friends and work in my speech, so I didn’t come off as a shill for Eli Lilly. That was good advice, but I wondered at the time if it was true. Were family and friends and work really equally responsible in making me better? Or would I be nowhere without the medication? The first time I was hospitalized was in 1991, after vandalizing an ER bed, pillow and waiting-room curtain with a large knife (I felt I was improving the décor). I was given Thorazine and it really was as close to a magic bullet as one could get. Before the pill, there was noise — unbearable clanging and scratching — in my head. After the pill, there was quiet. Before the pill, there were phantom insects scurrying along baseboards. After the pill, I saw nothing that wasn’t there. I was a zombie, sure — Thorazine wasn’t sustainable for the long term. But I saw a light at the end of the tunnel. Medication gave me hope. 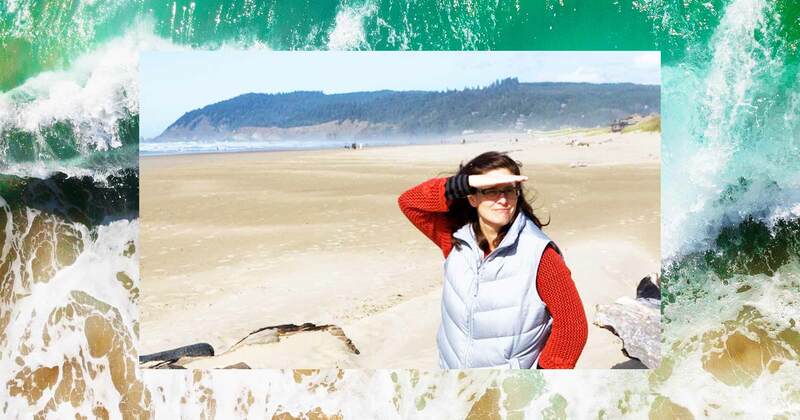 In the years to come, I often hyped the miraculous, transformational potential of pharmaceuticals, even though I’d gone through one after another after another, doled out by indifferent psychiatrists who saw me for 15 minutes a month. Sidelined from normal life by vicious side effects, I nonetheless believed — purely because I wanted to — that one day I’d find the right combination of chemicals to make me perfectly, exquisitely well. But a funny thing happened on the way to that hand-in-hand walk into the sunset with Big Pharma. 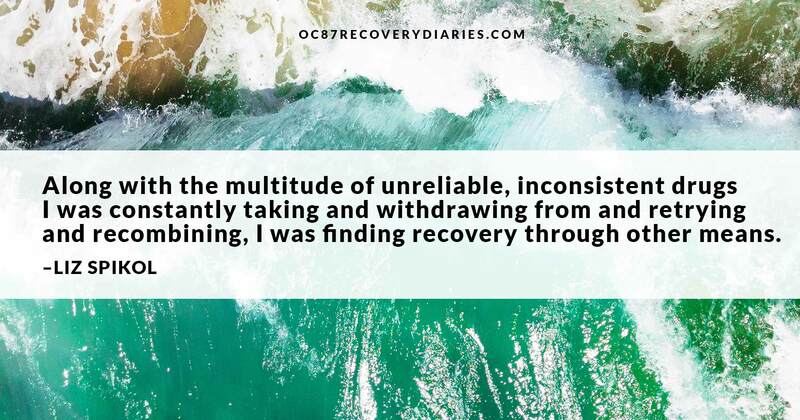 Along with the multitude of unreliable, inconsistent drugs I was constantly taking and withdrawing from and retrying and recombining, I was finding recovery through other means. I moved in with a very stable, reliable person, who helped me organize my chaos. I developed a fruitful psychotherapeutic relationship with my psychiatrist, and saw him multiple times per week. I got a dog that required constancy and a safe haven. And, most of all, I got off of disability and got a job in an office where other people acknowledged my existence. Slowly but surely, I became human again, after a decade in the wilderness. 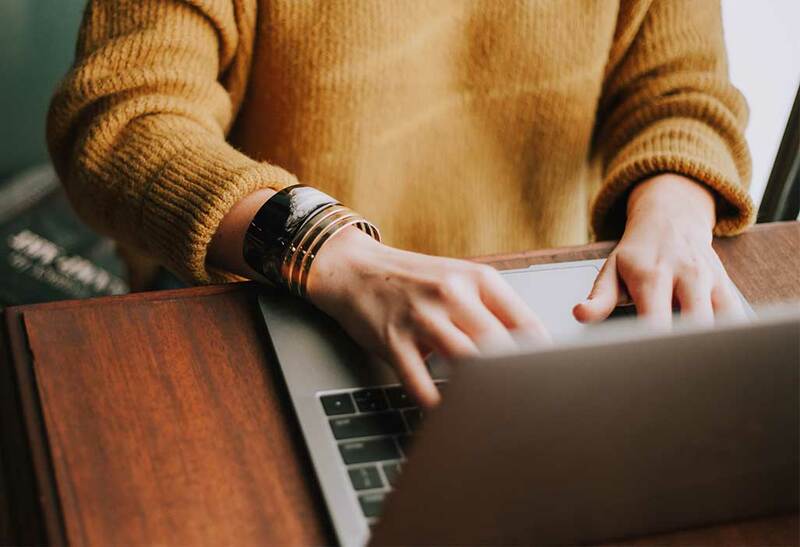 And I could not have believed that I deserved a second chance if it weren’t for the fact that, when I went to work, my co-workers greeted me with work-related questions and requests. They didn’t see me as parasitic and pathetic. It didn’t go that deep. “Liz,” they’d say, “these pages need proofreading before deadline” — and that was it. A task needed to be done, and I could do it. End of story. It’s been 16 years since my last psychiatric hospitalization, and I’ve worked full-time for almost all of those years. I see my psychiatrist once a month. I’m on fewer medications now than ever before. I am able to live alone and take care of myself reasonably well given the fact that I have a persistent illness that sometimes levels me for days. Or months. 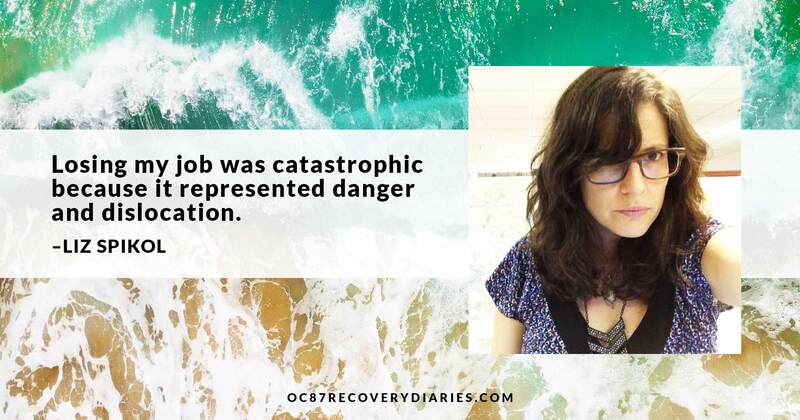 Losing my job was catastrophic because it represented danger and dislocation. Those of us in recovery are always frightened that the demons are just underneath the floorboards, waiting until some structural weakness in the house allows them to push up and out and take over the living room. For me, even a day without the right structure can pull me uncomfortably close to the edge of disappearing. I lose my tether to reality, and then it’s like I float away, like a balloon, with a vague, disconnected hope that someone or something will find a way to bring me back. It’s easy to stay in bed for two months when you’re a balloon. The truth is that even when I’m at my best — when all cylinders are firing, as they say — it’s an enormous struggle to get through each day. I believe that’s true for most people, actually, even those who don’t have psychiatric diagnoses: Life is hard, SEPTA is harder, we all endure. 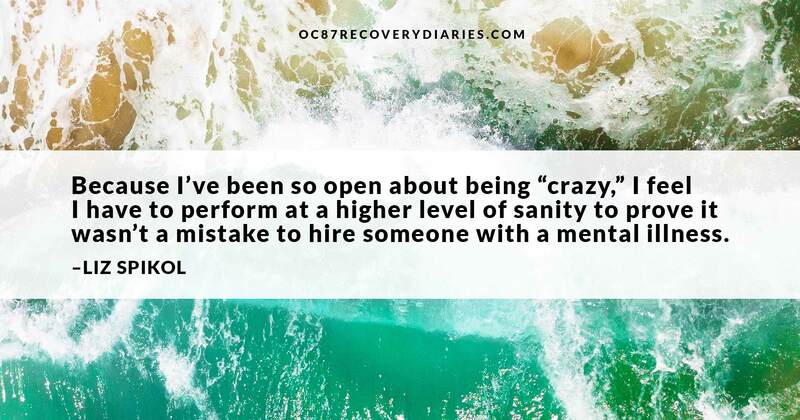 But at work I can’t afford to let anyone see the struggle: Because I’ve been so open about being “crazy,” I feel I have to perform at a higher level of sanity to prove it wasn’t a mistake to hire someone with a mental illness. I have to be the most normal person in the office, the most even-tempered and solid. And I generally am. When my boss chose to lay me off from the magazine, I feared my normal-person costume was more frayed than I knew. Ultimately, the two months in bed ended because the demons are not, as it turns out, living beneath the floorboards. I got myself together, slowly but surely, with help from friends and family and my doctor and, yes, some meds. But it wasn’t until I got another job — where I went into an office and talked to other people and answered questions about semicolons — that I believed I could definitively end the romance with my bed. Now I only dream about getting fired from the magazine once or twice a month, instead of every other night. Progress, my friends. Incremental it may be, but we move forward just the same. Liz Spikol is a Philadelphia-based writer whose work has been honored by the Keystone Press Association, the Chess Journalism Association, the National Mental Health Association, the Mayor’s Commission on Access and Disability, the Philadelphia Psychiatric Association, the Society for Professional Journalists and others. 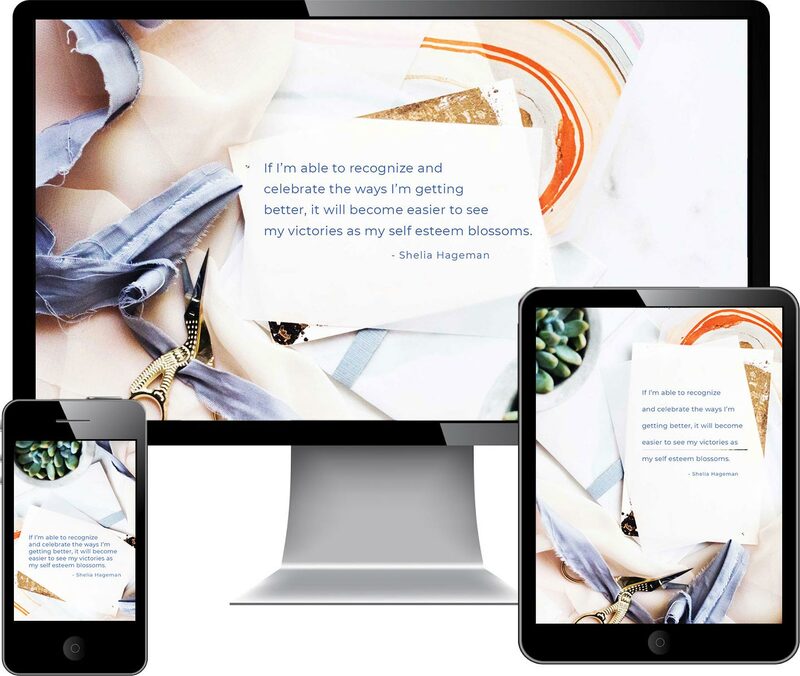 She has appeared in Style Weekly, the New York Times, Painted Bride Quarterly, and has been featured on National Public Radio’s “The Infinite Mind” and “Radio Times,” as well as on the Discovery Channel. 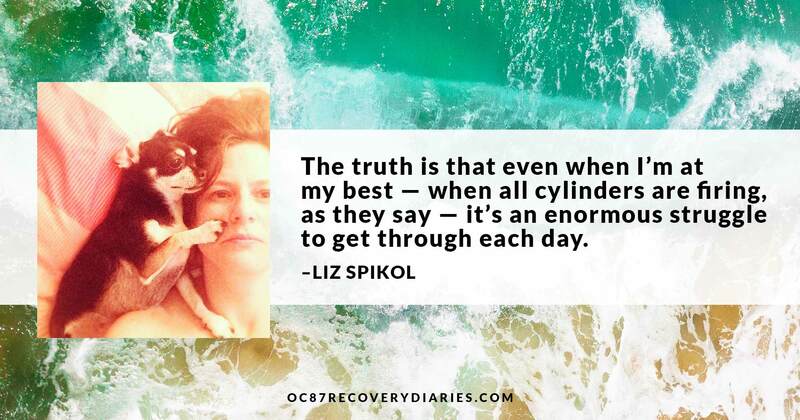 While a senior contributing editor of Philadelphia Weekly, Liz wrote an award-winning column “The Trouble With Spikol,” which began as a chronicle of her struggle with mental illness, and expanded into humorous musings on everything from graphic novels to how to use a mop. 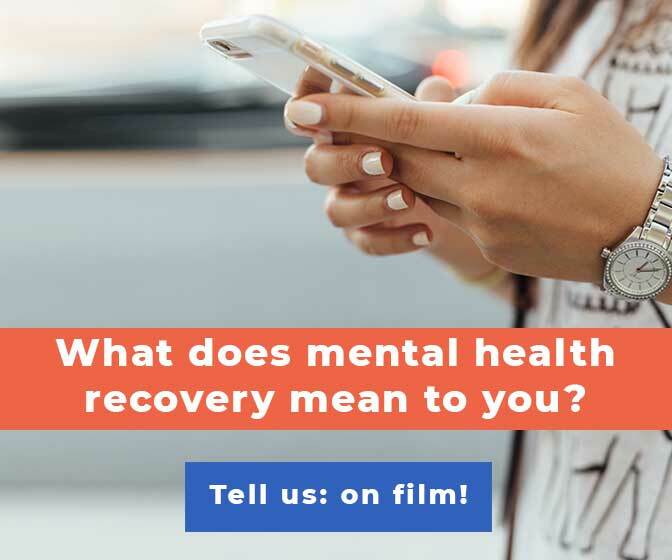 In 2012, she was featured in the documentary Of Two Minds, which explores the extraordinary lives, struggles and successes of three unique and compelling people living with bipolar disorder in America today. Liz Spikol writes for The Jewish Exponent in Philadelphia.